Is there a covenant on these parcels? What's to stop somebody buying them and then asking for a rezoning to something different? I recall there is a covenant in place that prevents the buildings from blocking the Bayview view. At the street fair when I was speaking to the Roundhouse/Focus guy he mentioned that the seniors center was almost set to go. I don't remember his wording but I took it as they were ready to start building. Given the date on the offering, maybe he meant that the approvals were all in place. Surveyors also spent considerable time there over the last few weeks. So if the tennis court is on private property, would it be for the public (public amenity) or for the Development residents only? 'Development residents' would mean it's locked... public could bring more than just 'tennis' being played in it. Not sure I like the latter. You should know by now those people stick to green, provincially owned properties in the core. Quick recap of what's going on. Unfortunately I was not able to connect with a Focus Equities representative prior to publishing the piece. 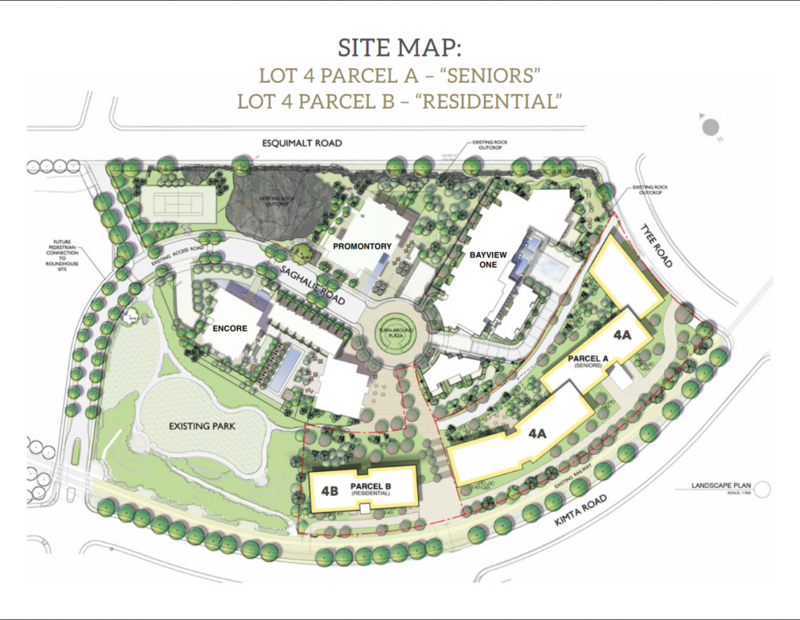 The next phase of Vic West’s 20-acre Bayview Place community will consist of a seniors residence and a low-rise residential building, according to marketing materials released by land owner Focus Equities. 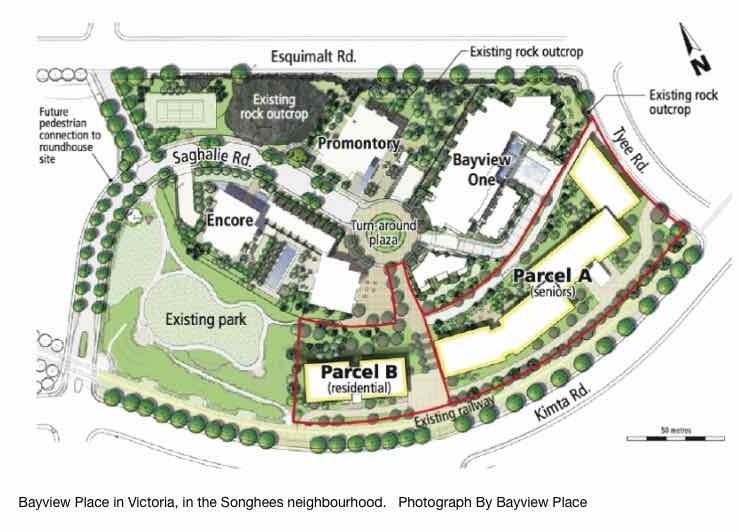 "The next piece in the Bayview Place puzzle will soon be coming out of the ground with a deal to build a seniors residence on the 20-acre Songhees site. 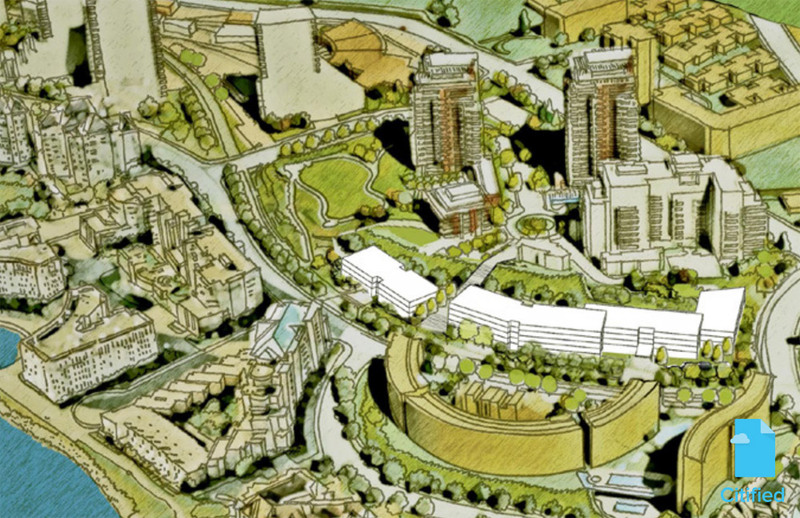 Bayview has reached a deal with Vancouver-based Element Lifestyle Retirement for nearly two acres of land below the Bayview One residential tower that will be used to establish a 153,000-square-foot seniors facility. For reference, here's Element's current mid-rise project in Vancouver's Cambie Village. And this is from last summer's Lot 4 sales brochure. would this work? what if the main entrance was up above using bayview's driveway, and another exit on the lower level, leading to a E&N stop in the middle of the circle? It's an interesting idea, but would it still work at the same height as the current plan? 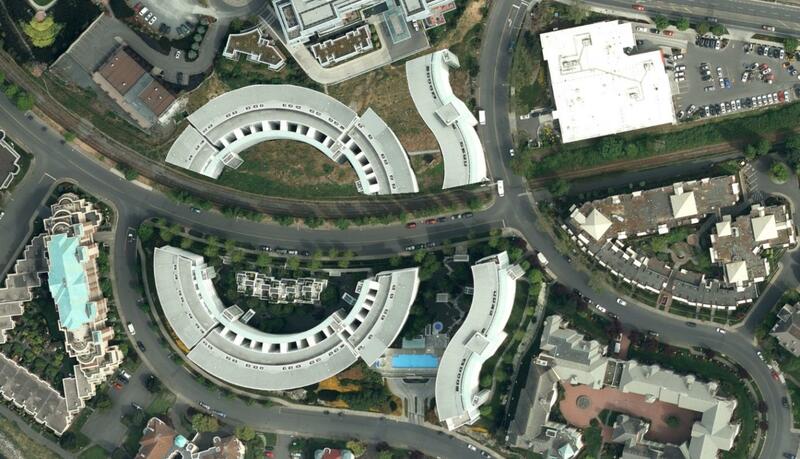 Alas, curved buildings are never going to be especially prolific in our region. The major part of this evening's Bayview Place get together was discussion of the new Element Lifestyle Retirement project. It seems like a great "age in place" concept. Here is a slide with some updated info of the project. 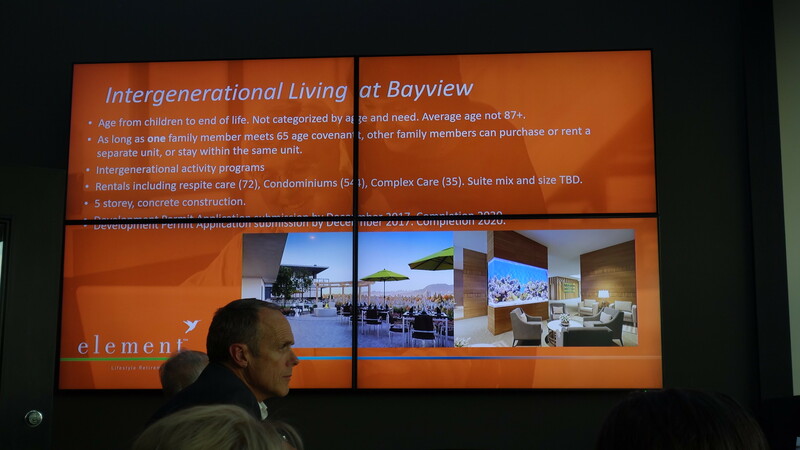 Quote: Gary H : The major part of this evening's Bayview Place get together was discussion of the new Element Lifestyle Retirement project. Hi Gary, I was unable to attend last evening... and it's interesting to hear that the focus was on LOT 4 Element Lifestyle Retirement. The work done to this point on LOT4 in the last few days has been been accessed via a newly constructed road access via the sales office entrance. They said they were working toward going to council for approvals in December, with construction of the senior's center starting in the summer. From the way the excavator is building a ramp and flattening the space I'm suspecting they're making a temporary parking lot. Parking in the area is tight and it will be useful as they ramp up the sales center for the new post-Encore building. 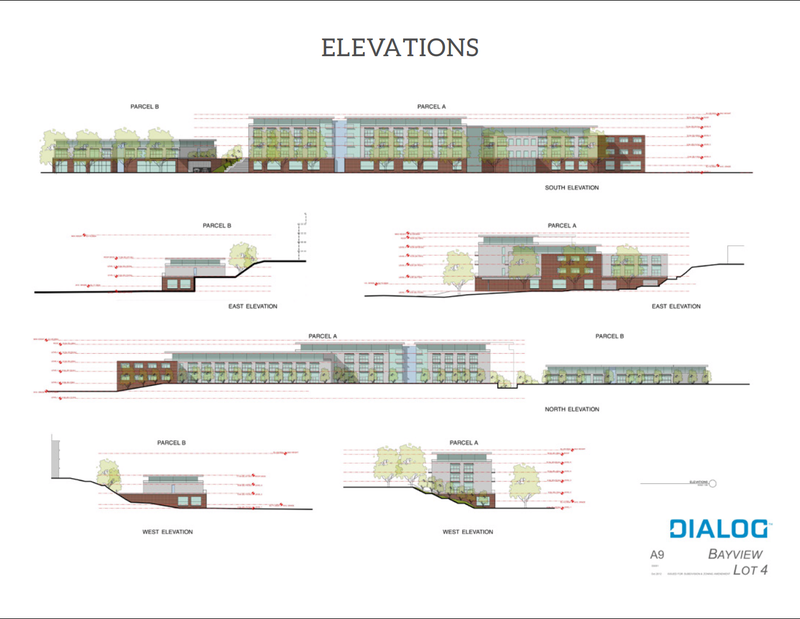 The corner of Tyee/Kimta is the most likely place for an entrance to the senior's facility. 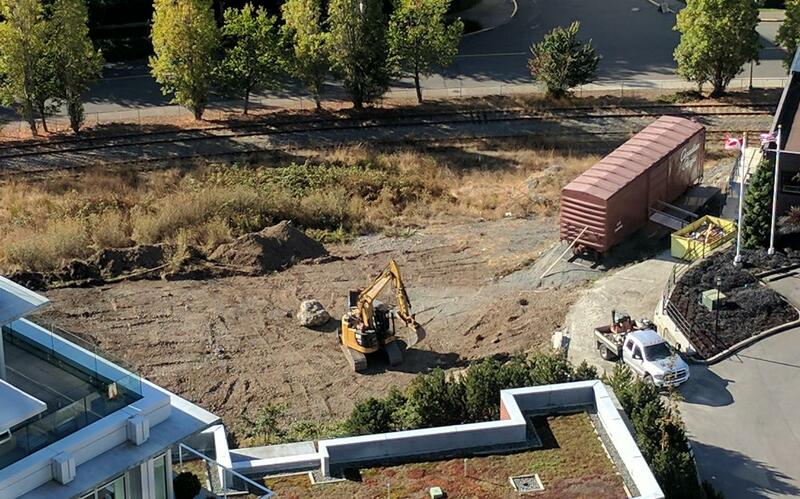 (On Tyee, before the railway tracks, about where the current eletrical transformer sits) They have to blast the hillside away to put the buildings in since there is a covenant that prevents them from interfering with Bayviews view. They also don't want to have traffic crossing the railway since that would involve expensive crossing arms. I spoke to Chris from Bayview before I left and asked about access to the new development once it's completed. All service access, including for ambulances, will be via Tyee Rd. and Kimta Rd. I imagine the goal will be to have most construction access from these roads as well. 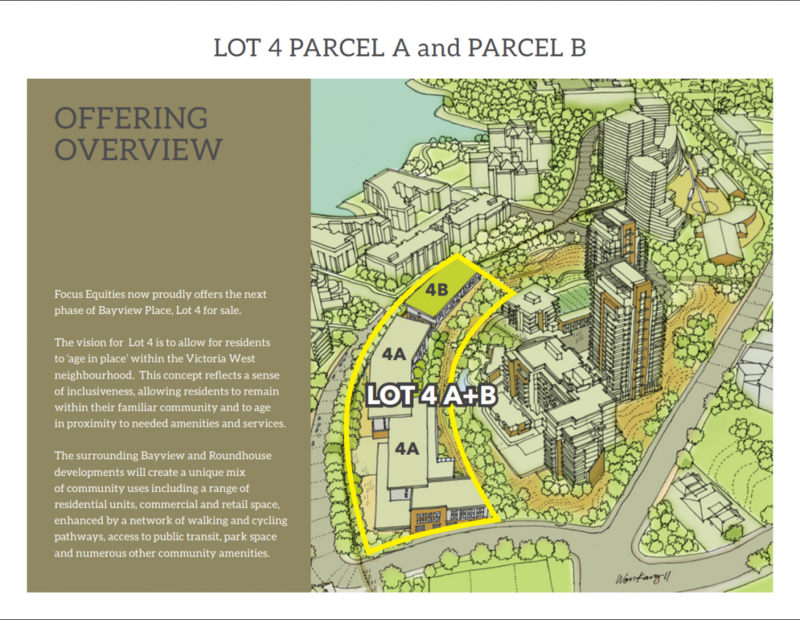 Another point, there is an easement in front of Bayview One that will become the new pedestrian access path to Tyee Rd. - replacing the existing gravel path through Lot 4. This new path will be paved and include stairs up the steep slope on the Tyee Rd. side. If Ken's goal of having the rail terminal built at the far west corner of the Roundhouse property is implemented then that essentially becomes the rail terminus. I could then envision the City removing the rail tracks along Kimta Rd. altogether. ...I could then envision the City removing the rail tracks along Kimta Rd. altogether. They might as well. After the JSB fiasco there will never be a rail link to downtown, despite the assurances that a rail right of way would be maintained. What's one more broken promise?